ROAD TOWN, Tortola, VI - Premier Dr the Honourable D. Orlando Smith and former Executive Director of the BVI International Finance Centre Sherri Ortiz have been featured in the 50th anniversary issue of Caribbean World magazine. The edition features Premier Smith talking to Caribbean World's Judith Baker about plans to increase tourism while trying to keep the islands as 'nature's little secrets'. Premier Smith talked about an increase in international flights over Antigua, San Juan and Miami possibly making it easier for anyone to get to the Virgin Islands. He also said the decision by American Airlines to reduce the number of flights to Puerto Rico has had a significant impact on the islands and consequently Government had a number of discussions with other carriers to replace the lost seats. The ferry service to Tortola from St Thomas, Premier Smith said, is also being improved for easier transition. He also spoke about Government's plans to extend the cruise pier in an effort to boost cruise tourism. Government's plans to protect the natural environment were also shared. 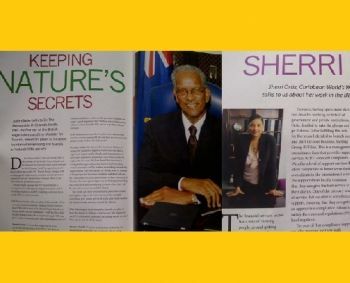 Meanwhile, Sherri Ortiz who was voted Caribbean World's Woman of the Year 2011 spoke to the magazine about her work in the VI's financial services sector. Ortiz spoke about her role at the IFC while there for the 5 years before moving to establish her own business, Sterling Group BVI Ltd.
She described her business as a management consultancy firm that provides support services to VI-resident companies. Ortiz said because of the role she played at the BVI International Finance Centre, the private sector has been extremely supportive of her. "This suggests to me that there is plenty of room for growth in this community and in this industry. I certainly believe that the experience I gained at the BVI IFC, and the contacts I made there, have had a significant effect in helping get my business off the ground," Ortiz told Caribbean World. More paid political advertisement but nothing happing on the ground! Shame the government cannot embrace your brilliance and incorporate it into their program to move the country forward. Your professionalism and excellence in business will take you to great places. That is so true Excellence! From what I understand, ppl there not doing diddly squat up there....Congratulations to Ortiz for branching out on her own. Wish you all the best Lady! Please let go of the past, deal with the present and focus on the future. You are of course entitled to your opinion, as am I and all other bloggers! Brilliance????????????????? "Talk is cheap!!" ....and that's all she has. they only move sherri because she is a VIP but shame on dem as the lady up dey now have not done a thing we even aint know the department dey..oh sorry Lorna has to approve everything i forgot!!! This lady wasn't put out to pasture to graze on her own? why every damn thing must be politics eh?